Apollo Munich Easy Health Insurance plan is a basic health insurance plan which can be taken as an Individual or as a Family floater ie., for the entire family. Apollo Munich Easy Health Insurance plan is a cover for treatment against illnesses and accidents or injuries requiring in-patient hospitalization. Apollo Munich Easy Health Insurance plan for both Individual and Family floater is available in 3 variants they are Standard, Exclusive and Premium. 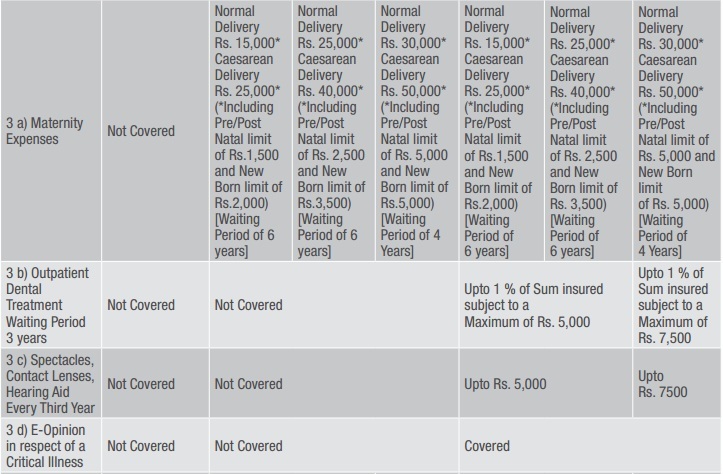 The cover amount under Individual plan ranges from Rs. 1,00,000 to Rs. 50,00,000 based on the product variant. The cover amount under Family floater ranges from Rs. 2,00,000 to Rs. 50,00,000 based on the product variant. Apollo Munich Easy Health Insurance Plan can be taken as an Individual or as a Family floater. Ayush Benefit which covers medical expenses for inpatient treatment taken under Ayurveda, Sidha, Unani and Homeopathy. Apollo Munich Easy Health Insurance Plan also features an optional cover that is Critical Illnesses cover. Tax Benefit: You can avail Tax benefits under Section 80D. For more information regarding Income Tax Benefits, visit www.taxqueries.in. There are few differences among the variants. 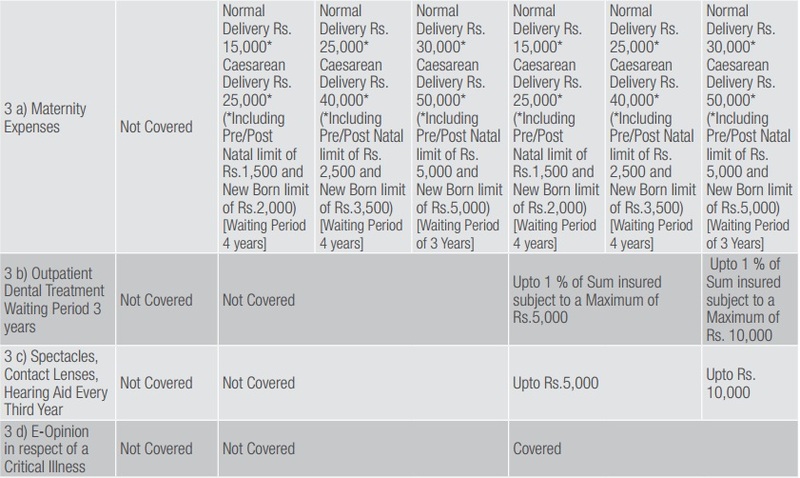 Features and Benefits of Apollo Munich Easy Health Insurance product variants under Family floater plan are shown in the chart below. Suppose Mr. Raju, his wife and their son are covered for Rs. 1 Lakh each, under a regular Health Insurance Plan. They would have then paid a premium for 3 policies of Rs. 1 Lakh each. In an unforeseen situation, if the medical bill for hospitalization of their son amounts to Rs. 1.8 Lakh, the regular policy would cover only up to Rs. 1 Lakh, while the remaining amount of Rs.80,000 would have been paid by Mr. Raju even though there is no claim on the other two policies. But if Mr. & Mrs. Raju opt for an Apollo Munich Easy Health Family Insurance Plan under any variant, the cover of Rs. 3 Lakh would be shared among the entire Raju family. Which means, the family individually and together, enjoy an insurance cover of upto Rs. 3 Lakh (total claim made by the family to be of Rs. 3 Lakh) . Hence for a similar situation as above, Mr. Raju would benefit while claiming the complete Rs. 1.8 Lakh under the Family Floater Policy. 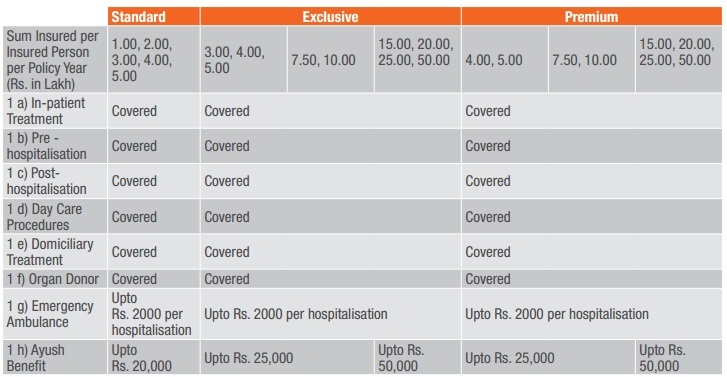 Features and Benefits of Apollo Munich Easy Health Insurance product variants under Individual plan are shown in the chart below. 30 days from the expiry date to renew the policy. No maximum cover ceasing age on renewal. Medical examination may be required in some cases, based on the sum assured and the age of the person. Policyholder will require to apply for a fresh policy if he/she renew the policy beyond the renewal date. Apollo Munich Easy Health Individual Insurance cover will be provided on an individual sum assured basis. Apollo Munich Easy Health Family floater Insurance cover will be provided on a floater sum insured basis. Premium at renewal may change due to changes in the applicable Tax rate or a change in your age. A maximum of 6 members can be added in a single plan. In a family floater policy, a maximum of 5 children and a maximum of 2 adults can be included in a single plan. The 2 adults can be a combination of Self, Parents, Spouse or Grandparents or Parents in law. Pre-hospitalization: Medical Expenses incurred in the 60 days before the Insured Person was Hospitalised will be covered. Post-hospitalization: Medical Expenses incurred in the 90 days after the Insured Person was discharged will be covered. Day care procedures: Medical Expenses for a day care procedure in this Policy where the procedure or surgery is taken by the Insured Person for less than 24 hours in a Hospital will be covered for listed 144 day care procedures. Ayush Benefit: Medical expenses for inpatient treatment taken under Ayurveda, Sidha, Unani and Homeopathy will be covered. Cumulative Bonus: Policyholder get a Cumulative Bonus of 10% for every claim-free year accumulating up to 100% (in the event of a claim, Cumulative Bonus will be reduced by 10% of Sum Assured on the next renewal). Tax benefit: You can avail tax benefits under Section 80D. Additional Cover for Critical Illness (optional): You can opt for an additional cover for Critical Illness which covers for cancer, first heart attack (myocardial infarction), coronary artery (bypass) surgery, kidney failure (end-stage renal disease), multiple sclerosis, major organ transplantation, stroke and paralysis. The sum assured for Critical Illness can be either 50% or 100% of your basic sum assured subject to a minimum of Rs 1 Lakh and maximum of Rs 10 Lakhs. Pregnancy, dental treatment, expenses arising from HIV or AIDS and related diseases, external aids and appliances is not covered under this plan. For detailed information go through the Form and Apollo Munich Easy Brochure attached below. Inform Apollo Munich about the planned hospitalisation 7 days prior to the admission. For detailed information go through the Form attached below. For intimation of claim, contact Apollo Munich at least 48 hours prior to an event which might give rise to a claim. For any emergency situations, contact them 24 hours of the event. You can contact them through, Toll Free: 1800-102- 0333, Fax: 1800- 425- 4077 and get detailed information. For Reimbursement of Medical Expenses, you should send the duly signed claim form and all the documents such as Hospital Main Bill, Pharmacy Bill, ECG, Hospital Bill Payment Receipt, Doctor’s Prescription, etc., to the company within 15 days of the completion of the treatment. In case the treatment is not covered under Easy Health policy a rejection letter would be sent to the provider within 6 hours. You must intimate Apollo Munich within 14 days of diagnosis of first occurrence of Critical Illness. You must submit a duly filled claim form along with specified documents within 45 days of completion of survival period for the Critical Illness against which the claim is made. Any additional information requested must be submitted to the company within 15 days of their request. On receipt of the complete set of documents company will forward the same to the concerned doctor. Who can buy Apollo Munich Easy Health Insurance Plan? Apollo Munich Easy Health Insurance plan can be bought by anyone aged below 65 years and can be renewed lifelong provided it’s renewed without break. What is the Family Floater Plan? One single policy takes care of the hospitalisation or medical expenses of your entire family. Family Floater Health Plan takes care of all the medical expenses during sudden surgeries, illness and accidents. Is there an Income Tax exemption under Apollo Munich Easy Health Insurance policy? Under Apollo Munich Easy Health Insurance Plan you can presently avail tax benefits for the premium amount under Section 80D. of the Income Tax Act.